To follow the history of the Kwan family is to trace a complete history of Hong Kong graphic design. In 1845 the ‘China Trade’ artist Kwan Chuk Lam, known to the West as ‘Lamqua’ settled in Hong Kong. He was the only known pupil of the English painter G. Chinnery, and had exhibited paintings at the Royal Academy in the style of his master. His ‘Handsome Face Painter’ shop followed a system of serial production and a division of labour, a common practice documented in the Illustrated London News. His descendants followed this commercial principle, moving into the related fields of photography, lithography, poster design and advertising, a family that today numbers more than a hundred. Kwan Wai Nung (b 1880) learned Western painting from his family and Chinese painting with Gui Koo Chuen. Kwan was employed as a printer, producing the first five-colour lithographic works in China, and in 1911 became Art Director of the South China Morning Post, leaving in 1915 to found the Asiatic Lithographic Printing Press Ltd. Art and business were to Kwan wholly compatible”. Kwan Wai Nung became the ‘King of Calendar Art’ during the 1920s and 30s with a series of ever more accomplished designs. 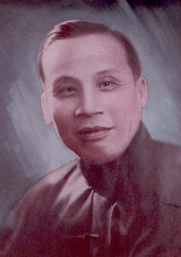 His sons and nephews established companies such as Mercantile Printing Co., Tin Chun Lithographic Press, Golden Key Advertising Co. and Paramount Co.
Hugh Farmer: You will find in The Enchanting Years… link below further details about Kwan Wai Nung and examples of his beguiling art promoting a variety companies in Hong Kong through calendars and posters. This article was first posted on 10th August 2014.